Turn your dials to the Rediscover the 80s Podcast and a brand new episode of Rank 'Em, the Top 5 countdown show! Continuing the 30th anniversary of 1988, we are going to adjust our rabbit ears and watch some television. Jason welcomes first time guest Mickey Yarber, host of RetroRamblings.com, to rank our favorite shows that debuted in 1988. We begin with the normal context of the year by running down the top 10 rated shows from the Fall 1988 - Spring 1989. 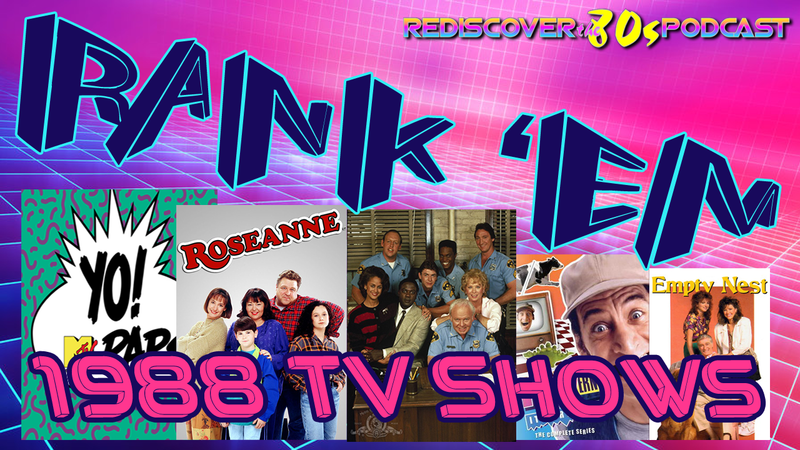 You'll also hear some moments in 1988 TV history and then we dive into our Top 5 lists which include many different genres like sitcoms, game shows, dramas, and reality TV. (Animated shows will be saved for a separate podcast.) We then end the show by going through the 1988 TV Guide Fall Preview issue.